The Replication Rapid-Prototyper Project (RepRap) is a movement with the goal of providing Open-source, diy (do-it-yourself) 3D Printers at low costs to 3D Printing hobbyists. RepRaps are 3D printers with the additional ability to produce most of the parts necessary to assemble another identical printer. In other words, they are machines that could clone themselves. 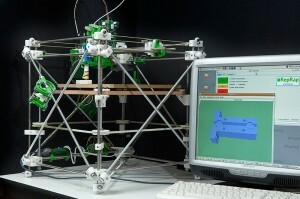 Most RepRap’s use fused deposition modeling (FDM). FDM creates 3d parts by depositing a thin bead of molten plastic across a flat print area, one layer at a time. ReRaps are known to print exteremly accurate parts of themselves!! The RepRap printer was invented in 2004 by Adrian Bowyer, a senior lecturer in the Mechanical Engineering Department at the University of Bath. In his essay titled, “Wealth without Money,” he romanticizes that the project’s general concept is Marxist in nature because the existence of a machine with the ability to copy itself can, in theory, expedite power to the powerless. The theory suggests that with the introduction of RepRaps, larger manufacturers which produce goods in an arithmetic progression (e.g. assembly lines), would no longer be the most efficient method of production.